HYDE LOUNGE ENTRY LOCATED AT THE SOUTHWEST VIP ENTRANCE TO STAPLES CENTER. 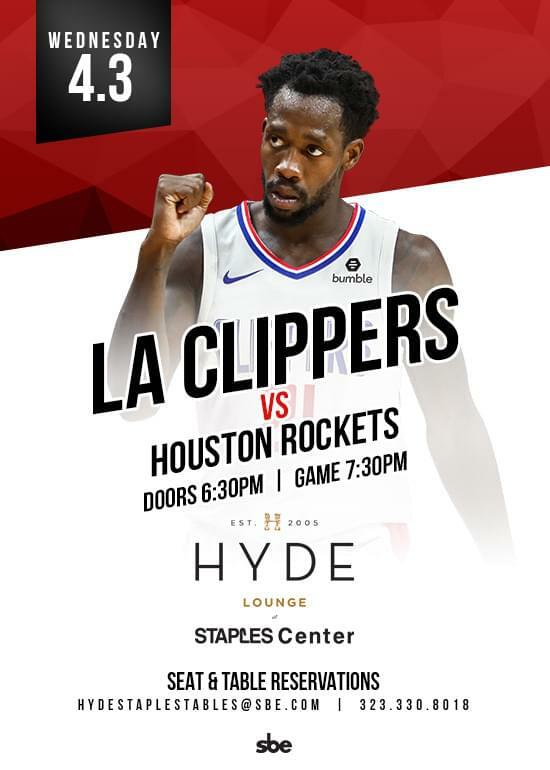 LA Clippers vs. Hpuston Rockets at Hyde Lounge at STAPLES Center. Doors open at 12:30PM, Tip-Off at 2:00PM. 21+ with valid photo ID. Dress code enforced. Shorts, tank tops, and sandals are not permitted. Entry at Management Discretion. 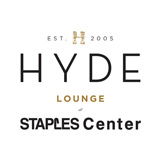 Hyde Lounge at STAPLES Center, located on Delta Suite Level C of STAPLES Center in Downtown Los Angeles, delivers the ultimate viewing experience for sports and entertainment. The 4,000 square-foot ultra-lounge features three bars, ledge seating, a dancehall and a private “Great Room.” Floating LCD TV screens, rosewood walls, and plush table service provide a pristine viewing environment for some of the world’s greatest concerts, shows, and sporting events.